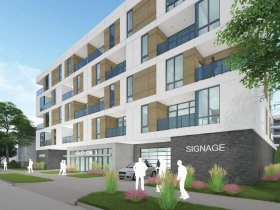 City committee approves "adventuresome," five-story, 96-unit building. 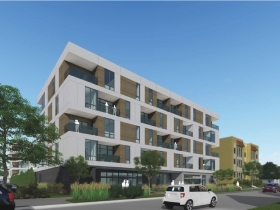 Klein Development Proposal along N. Arlington Pl. Rendering by Eppstein Uhen Architects. A five-story, 96-unit apartment building was approved for a large site just south of E. Brady St. today. The Zoning, Neighborhoods & Development Committee unanimously approved a zoning change for the project. The proposed building would be developed by Klein Development Inc. on a vacant lot at 1632 N. Franklin Pl. The lot, which city records list at 42,459 square feet, was the site of a long closed Boys Club that was demolished in 2016. The development team, KC Franklin Partners LLC, acquired the site in August 2015. The development team, which includes Klein brothers Joe and Mike as well as Jeno Cataldo, dropped the height of the building to five stories, reduced the unit count and consolidated all parking garage entrances to the east side of the building along the currently one-way N. Arlington St. Pedestrian entrances and elevators will be included on both N. Arlington Pl. and N. Franklin Pl. Kovac is clearly sold on the design, telling his fellow committee members “with the right materials this could be a really unique, amazing design. With the wrong materials it could look really cheap. For instance, if there were any EIFS it could look like a Burger King.” Kovac went on to note that “I do think this is unique.” The alderman noted that while it would be impossible to design a building to please everyone on the East Side, he was sympathetic to the notion that every new building looks the same. Kovac, who at one point called the project “adventuresome architecture,” noted that when the developers originally approached him and the Department of City Development they were seeking a 14-story tower and that the developers could have made a reasonable case to be granted a building of that height. 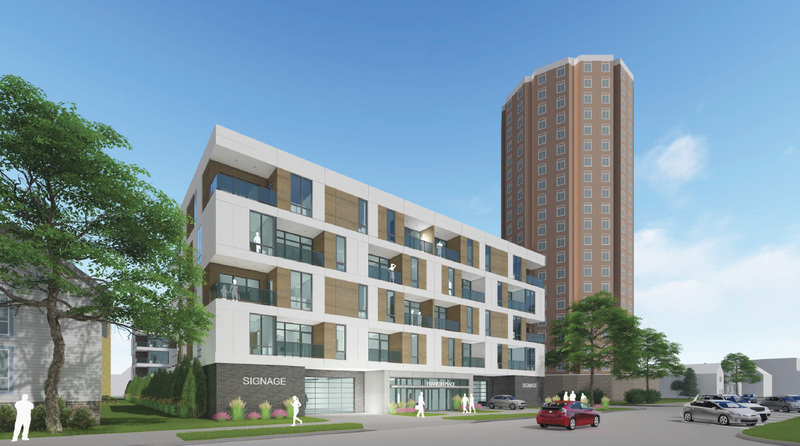 The proposed building is next to a city-owned senior housing high-rise that is approximately 24 stories tall, yet within a neighbor that includes a number of structures that are four stories or less. The developers came back with a building that was 10 stories and 140 units, but ultimately cut that to five floors after meeting with local stakeholders. 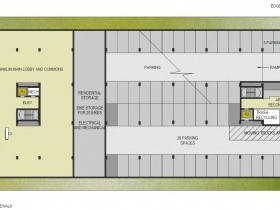 The building would include a substantial amount of parking. 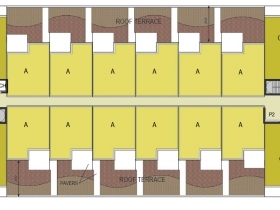 Plans call for 133 stalls split over the first-floor and an underground level, providing a ratio of 1.39 stalls per unit. 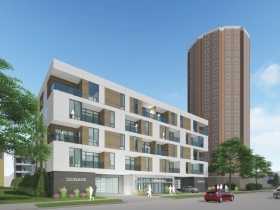 The building will be a mix of studios (24), one-bedroom (64) and two-bedroom (32) units. The 157,000 square-foot development would cost approximately $20 million to build and have rents ranging from $1,500 to $2,000. Developer Joe Klein has previously said he hopes to being construction on the project as soon as possible. The zoning change still needs approval from the full Common Council. Kovac concluded his remarks on the project at committee by noting that he would bring forward a file to convert N. Arlington Pl. from E. Brady St. to N. Warren St. to a two-way street. This change is not required for the project to go forward, according to Kovac, but is something the developers and neighbors are behind. Kovac also noted that a conversion on Arlington Pl. from angled parking to parallel parking would increase the amount of street parking spaces. Included in the project already is the construction of pedestrian bump-outs along N. Arlington Pl. The bump-outs will increase pedestrian safety by shortening the distance to cross the street and increasing pedestrian visibility to vehicles. The bump-outs are scheduled to be constructed along with the project itself. Examples of bump-outs can be see along E. Brady St. 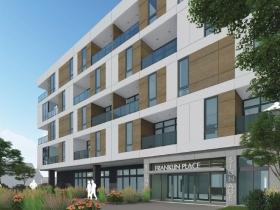 Proposed five-story, 96-unit apartment building for 1632 N. Franklin Pl. The Brady Street area used to be a working class neighborhood. Now that it’s been “gentrified”, people who don’t have a great high paying job cannot afford to live here. I guess $1,500 is the new lower apartment rate, but I do not personally know anyone who can afford that. What does it take to build affordable housing for low income people? Molly, I was shocked to hear that so I took a peak myself and saw many apartments under 1,000 with some as low as $600 for a 1 bed or efficiency. If that’s not affordable, I don’t know what would be considered so. Remember that although the new apartments built are generally pretty pricey, they help depress the rates of the older buildings to make more of them affordable. There are new one-bedroom apartments going for $600 in that area? There’s nothing but new apartments in the Brady Street area? New construction won’t necessarily be “affordable” depending on how that’s defined. But new construction helps “soak up” the demand for nicer units that would otherwise be filled by upgrading existing/older units. In this way, new construction, even if not affordable, does indirectly help keep rents affordable in other units. How are they going to put 96 apartments in a 4 story building?